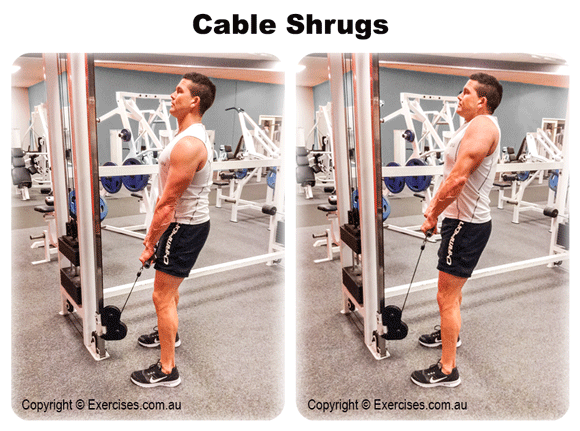 Cable Shrugs is a great exercise for building the traps, shoulders, upper back, biceps and forearm muscles. It also activates the core muscles to keep the upper body stable and the lower back supported. 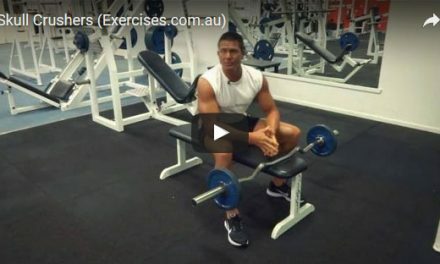 Cable Shrugs is an effective exercise because it keeps constant tension on the muscles involved plus gives a strong contraction at the top and stretch at the bottom position. Adjust the rope pulley handle of a cable machine at the lowest setting. Grab the ends of the rope pulley handle. Take a few steps back to create tension on the cable. Assume a shoulder width position; lean back slightly, tighten your core, slightly bend your knees and elbows. Take a deep breath; exhale then shrug the rope pulley handles up toward the back of your ears. Pull your shoulders back and hold the position for a count of “one”. Resist the weight on the way back to starting position. Make sure to get a good stretch on the traps and shoulders at the bottom. With Cable Shrugs instead of pushing your traps to your ears, push your traps behind your ears. This position increases the contraction on the traps, rear shoulders and upper back. Do not bend at the hips or use momentum to shrug the weight up. Maintain a slight bend in your elbows to keep constant tension on the shoulders instead of the biceps.